Power and Politeness in the Workplace has become established as a seminal text for courses in language and professional communication. Co-authored by bestselling author Janet Holmes, this text provides insights into the way we all talk at work, including a wealth of material illustrating the way people communicate with each other in their ordinary everyday encounters in their workplaces. The analysis focuses, in particular, on how and why people "do" power and politeness in the workplace, and examines the discourse strategies involved in balancing the competing demands of meeting workplace objectives and getting things done on time with maintaining good collegial workplace relationships. Drawing on a large and very varied corpus of data collected in a wide range of workplaces, the authors explore specific types of workplace talk, such as giving advice and instructions, solving problems, running meetings and making decisions. Attention is also paid to the important contribution of less obviously relevant types of workplace talk such as humour and small talk, to the construction of effective workplace relationships. In the final chapter some of the practical implications of the analyses are identified. This Routledge Linguistics Classic is here reissued with a new preface from the authors, covering the methods of analysis, an update on the Language in the Workplace project and a look at the work in the context of recent research. 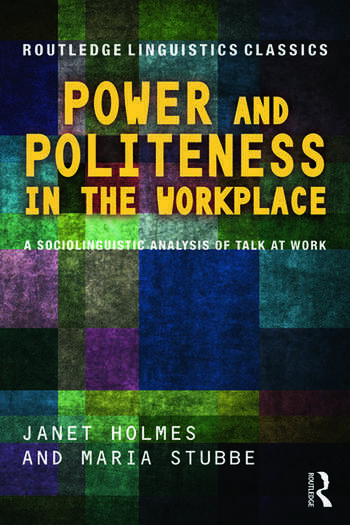 Power and Politeness in the Workplace continues to be a vital read for researchers and postgraduate students in the fields of applied linguistics and communication studies. Preface. 1. Power and Politeness and the Workplace Context 2.From Office to Production Line: Constructing a Corpus of Workplace Data 3. Getting Things Done at Work 4. Workplace Meetings 5. Small Talk and Social Chat at Work 6. Humour in the Workplace 7. Miscommunication and Problematic Talk at Work 8. Conclusion: Some Implications and Applications. Janet Holmes is Emeritus Professor in Linguistics at Victoria University of Wellington, New Zealand and a Fellow of the Royal Society of New Zealand. Maria Stubbe is a senior lecturer and Director of Research in the Primary Health Care & General Practice Department at the Universtiy of Otago, New Zealand.